There is no such a state as too many coffee shops, but most U.S. cities do at least have a sufficient supply. Whether you like to grab a standard cup of joe, or prefer your morning espresso frothed and sweetened, you can find your satisfaction in and around the city limits. Once outside those metro areas, though, pickings can be dreadfully slim. If you’re lucky, you might happen upon one or two local shops with espresso on tap. More likely, though, you’ll be relegated to a lackluster stream of diners and chains for your coffee fix. Stale Dunkin’ Donuts Express at a gas station, anyone? So, whether you’re a frequent roadtripper, a camper, or you make your living on the road, these best portable travel coffee makers are the right fit for those who take their coffee truly to go. Check out our reviews below for our top rated picks. Not every car can be a Fiat with its built-in coffee maker and dashboard light that gently coddles one’s coffee addiction by reminding the driver when it’s time for a caffeine-fix. Unless you’ve had it souped up coffee style, in any other ride, you’re the one responsible for the coffee creation. When you plan to roll through out of the way places in a car without its own coffee maker, you need coffee equipment that works equally well at making straight-up coffee or perfect espresso, and you’ll find that combination in the Aerobie AeroPress. The AeroPress Coffee and Espresso Maker is small, it’s lightweight, and it’s pretty much a godsend for coffee addicts on the road. Carry your coffee and AeroPress filters with you, and all you need is hot water, which any gas station can supply. And it will save you a lot of money when traveling (if you drink as much coffee as I do!) since the price is around the equivalent of three or four large Starbucks lattes. For me, this thing would pay for itself on the first day of a road trip! It only takes about a minute to take your coffee scoop to pour, and in my opinion the flavor produced by the AeroPress is so impressive, even restaurants like Urban Angel in Edinburgh, Scotland and praised U.S. coffee chain Stumptown Coffee Roasters have AeroPressed coffee on the menu. When it comes to camp portability, backpackers and backcountry campers are most limited in their space for coffee equipment, but even campsite campers benefit from keeping their supplies light. The GSI Outdoors Collapsible JavaDrip Slim Drip Coffee Maker is an ideal coffee apparatus for any camper. For me, it meets the two most important criteria (in my opinion) – it is cheap and it works as advertised. 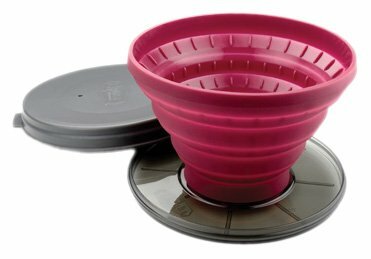 According to the manufacturer, it is designed so that it holds a #4 filter, which means that you can make anywhere between one cup and 12 cups of coffee at camp. This is great because you can easily adjust depending on how many people are out with you. Great for car camping, tent camping and glamping. Also good for java addicts like me who need that fix every few hours when hiking or backpacking. Weighing less than 5 ounces, the coffee cone collapses down to a one inch disc that can easily be slid into a small pocket or the leftover space in a pack. The base of the cone is specially designed to fit on cups and bottles with wide mouths without moving. And, unlike many collapsible coffee cones, the JavaDrip Slim Drip is built with sturdiness in mind, so those incidents you might have had with collapsing cones of boiling water are a thing of the past. As you can see, it is made of plastic and has a bit of a latex smell when new, however this does not affect the taste of the brewed coffee. One thing to note is that it does make coffee slowly (in my opinion), so you’re looking at about two minutes or so to get two decent size cups of joe from it. It’s not really that long, but if you’re used to using a Bunn then it might seem like an eternity! Inexpensive, and free of protruding pieces that can easily be snapped off in a pack, this is a simple coffee maker for your nature getaway. It is easy to store and easy to clean – what more do you need? If you want the best battery-powered coffee maker in the world, you’d better be willing to jump on a plane and buy an adapter. The Trisa Coffee to Go espresso maker is hands down the world’s best (and kind of the only) truly battery-powered coffee maker. Unfortunately, the Trisa Coffee to Go is available to a limited European market, so in the U.S. you’ll have to settle for the next best thing. 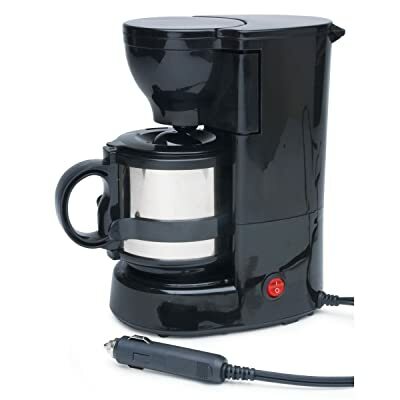 Unfortunately, the choices of battery powered coffee makers in the U.S. are sadly slim. Not truly battery-powered, the coffee makers in the U.S. run off 12-volt batteries, which means they have to be hooked up to your car’s power supply and they have a reputation for being real battery-suckers. Of course, it’s not all bad as this little gadget has an affordable price and my experience shows that in just 15 minutes it can deliver up 16 piping hot ounces of coffee for your drinking pleasure. Just be careful not to spill it on your lap while driving! Camping, at the office, or traveling by car, a Vietnamese coffee filter set is a top-notch solution for portable coffee making, at least in my opinion. 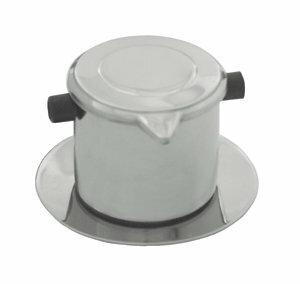 Simplistic, small and lightweight, the stainless steel components of this coffee maker come in under half a pound total. Somewhere between the GSI collapsible drip and the AeroPress, the Vietnamese coffee filter has become a go-to coffee maker for anyone who wants to make great coffee, regardless of location. In my opinion, it seems to have the most affordable price compared to the other options and it is ultra portable. You can even use it at home on a regular basis. When you buy one of these sets, you get several stainless steel pieces. It includes the saucer, the brew chamber, the insert press, and the lid. It also has rubber handles so you do not have to worry about burning yourself when trying to make coffee. For the best results using this, I suggest that you go with coffee with a medium to thick grind. Based on my research, most people who use this on a regular basis stick with Trung Nguyen coffee for optimal brewing results. The video below can give you some tips on brewing the perfect cup o’joe with one of these. In my opinion, the best thing about each of these coffee makers listed above is how interchangeable they can be. While the GSI Outdoors Collapsible JavaDrip Slim Drip Coffee Maker listed at the top is most compact, for instance, there is nothing stopping a truly dedicated joe-master from finding a spot for an AeroPress in his or her hiking pack. Once you find the portable coffee maker that suits you best, stick with it. You will always be able to brew up the perfect cup of coffee, no matter where you are or how you’re traveling.